ginger2005's review (This content has been automatically translated from French)" A disaster"
Very disappointed in this sound card. It is crazy to become unstable, emits noise in the speakers after several minutes. Unless I fell on a model DEFECTIVE, but given the various opinions on the net I am not alone. I have trouble understanding how to market a product as little stable addition for a price of 500 €. Go your way. I'll watch out my 1818m. Nothing to see. Realaze's review (This content has been automatically translated from French)" Not for beginners." Outputs, inputs, firewire, USB, in short, the possibilities of routing it smelled hot sand. 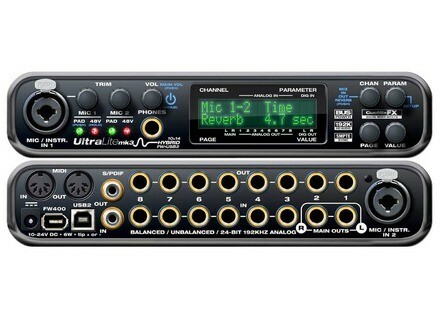 - Which instruments or systems (console, preamp, DTD ...) you use it and how connections? In the basic external sound card, plugged in and Jack live console. - For what purpose? What is your config (Motherboard / CPU / RAM / Disk ,...)? Asus Pc of a pretty good bill, to go out and run a monitoring since FLStudio, doing the final mix is ​​then internally. I said that it's all very theoretical, the drivers are so unstable in the end I mostly used the card to listen only to exploit the inputs and outputs. No, it crashes often for no apparent reason and when it crashes blue screen is direct, very disabling. - Are they updated frequently? Okay, but I tend to really buggers on the tracks and effects. - How many tracks you get to record / play simultaneously? I gave up this ambition I had to do everything with a PC, I decided to switch to multi-dedicated recording computer is not for me. - Have you encountered any incompatibilities? - The manual is clear and sufficient? - What is so special that you love the most, least? Plus: The sound is good, it is very versatile, and it provides when I deal with FLStudio, I guess it is also very effective for people who have managed to resolve their config to the millimeter to not plant it. Routing possibilities seem really huge, maybe too much. Minimum: the repeated crashes are really discouraging, I read that I was not alone in this case, I was reassured, but no more. No updates to the drivers when they are not stable, it is very unfortunate. Too expensive in view of the crashes that nullify any productivity.